First published Canberra Times 26 October 2011. With our body-aching recent house move over, and the days getting longer and warmer, I settle down to prepare and mulch my new vegetable patch, in readiness for planting. I usually plant a crop of tomatoes each year, because store bought ones just don’t compare. As the season approaches I look forward to bottling my own tomatoes to provide the base for many of our summer meals. Is it me, or are the tomatoes that we buy now missing the sweet intensity compared to those when we were kids? Mum would send us up the road with a list to Mr Gorring, who sold his freshly grown produce direct from his market garden. He was a hunched and wizened man, baked as golden-brown as a roast potato, acquired from his time in the sun tending his garden. He spoke with a strong German accent and I never saw him dressed in anything other than shorts and sandals and an aged, brown leather apron. We would stand in front of his old table with a set of suspended scales hanging above and recite our order to him from our list. With nothing but a curt nod he walked off slowly to pick the vegetables straight from the garden. He came back to the table to weigh each variety of vegetable meticulously, and charged us for every ounce. Mum would always warn us to watch for him putting his hand on the scales. Although Mr Gorring never made small talk, and made it clear he didn’t appreciate our over enthusiastic dog, he had the very best and freshest of vegetables on offer. As we walk home barefoot, with the string bag stretched tightly around our newspaper wrapped vegetables, the herbal, tomato-leafy aroma wafts from our parcel of freshly picked produce. Today that same smell still triggers this odd fragment of memory each time I pick my own home grown. To manage my annual yield of tomatoes, I preserve the excess in bottles. This is an easy method that is packed with flavour. Wipe the tomatoes, slice out the cores, and pack them whole, including the skins, into sterilised jars. I use medium sized preserving jars with the rubber seal and wire clip. Add a few thyme sprigs, some bay leaves and a couple of slices of onion. Ensuring the rubber seals are on properly, clip the lids shut and put the jars on a round cake rack that fits in the bottom of a deep pan. Add enough water to cover them well and weigh them down with something heavy if they float. A rock will work. Simmer the jars for about 1½ hours until the tomatoes lose their shape and collapse. The jars will only be half full when the tomatoes are ready. Leave the jars in the water to cool. The lids will have formed a tight seal and the tomatoes will keep for about 12 months. 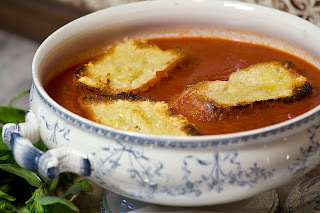 I like to make this soup with my harvested home bottled tomatoes, although you can use tinned, peeled tomatoes or fresh ones. 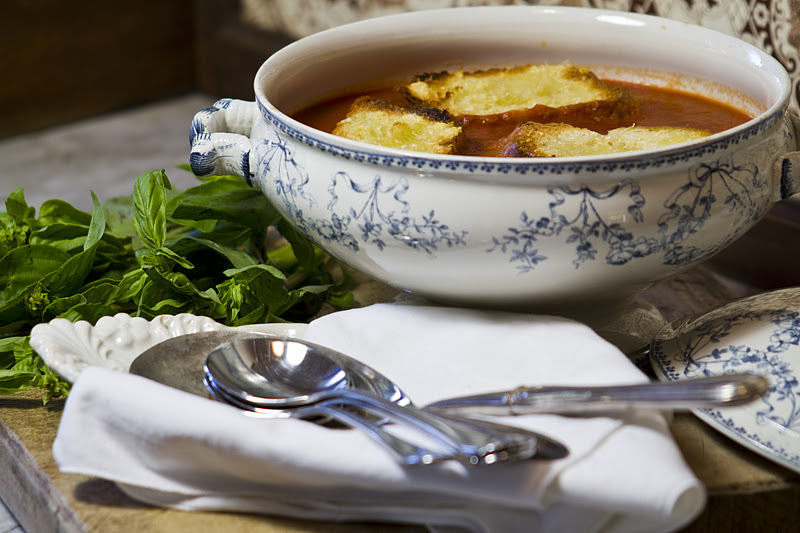 The complimentary orange and tomato flavours in this soup make a great summer lunch that can be eaten hot or cold. Roughly chop the tomatoes. Heat the oil in a large saucepan and fry the onions until tender but not golden for 5 to 7 minutes. Add the garlic and continue cooking until soft, 1 to 2 minutes. Add the chopped tomatoes and any juice, with just enough water to cover. Add the bay leaves, thyme, sugar, salt and pepper and cover the pan with the lid. Bring the soup to the boil, then reduce to a simmer until the tomatoes are very tender, about half an hour. Meanwhile, heat the oven to 175C and slice the baguette into slices and put them on a tray. Brush each one with olive oil on both sides. Bake them until dry and lightly golden for about 10 minutes, then top with the grated cheese and return to cook until browned. Remove from the oven. Strip the basil leaves from the stems and add them to the simmering soup. Shred the leaves and set aside. When the soup is cooked, remove the herbs and basil stems and puree the soup in a food processor. Return the soup to the pan and bring to the boil. Stir in the shredded basil, orange zest and juice. Taste for salt and pepper. Serve soup in large bowls and add a round or two of cheese-topped baguette to each one. First published Canberra Times 19 October 2011. Journeying into the countryside, with Beaune in the heart of Burgundy as our base, I encounter many of the local characters who live and breathe French cuisine. These are the people who greatly contribute to the charm and flavour of the Burgundian table. The farmers in these parts believe that the fruits of the Burgundian earth “please each other” with much of the produce grown side by side. This harks back to the times when there was once an economic imperative to do this, in the share-cropping days when labourers would plant a crop of their own among the landlord’s vines. We stop off for lunch at a little Auberge that is surrounded by vineyards with vines in their first spring bud as far as the eye can see. The amiable and generously sized owner recommends the chicken in red wine vinegar as the day’s specialty, explaining he brews his own vinegar from the renowned local wines. A woman wearing an apron sticks her head out of the kitchen and beckons us to sit outside at a table in a sunny corner out of the wind. Next to us, is a large table of workmen who are noisily eating their way through the red wine vinegar chicken. They mop up the juices with bread and share jugs of wine. They all leave together and kiss both hosts goodbye, walking up the road to return to work in a nearby vineyard. Our jovial host pronounces the red wine vinegar as vin aigre, meaning acid wine. Appearing to be not in a hurry to clear up tables, he sits down with us to explain the process in detail. He brews it in a large earthenware crock with a tap, using leftover red wine. He says you start with the floating, cloudy-looking membrane, that is found floating on top of the remains of a bottle of vinegar. He calls this jelly-like substance, the vinegar mother. You pour the mother and the vinegar into the crock and add a bottle or two of a fruity red wine, covering the top with some cloth so it can still breathe. The vinegar remains like this for six months or so before you should taste it. When you do, it should have a mellow flavour. If it’s still too sharp, leave it for about another month. All you need to do to keep it producing is to top the crock up with some red wine every now and then. Although keen to try the brewing when I get home, I focus on the chicken. It’s meltingly tender, with only a touch of piquancy from the vinegar. I’m loving the garlic flavour, that provides a hint of sweetness. The recipe was kindly provided by our host, and I’ve made assumptions with quantities. I’ve made this recipe a few times now, and it’s incredibly simple and quick. 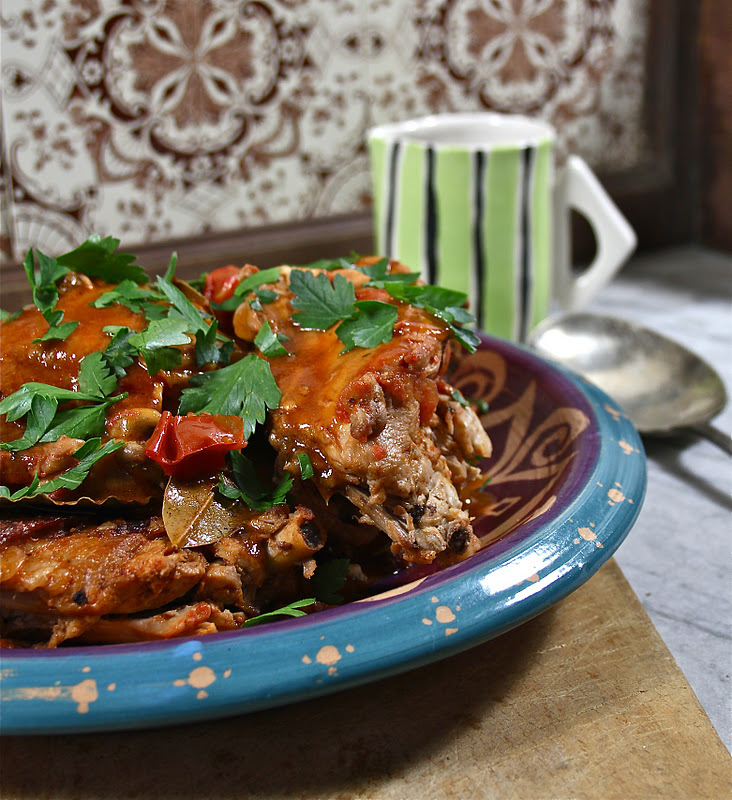 It’s perfect for a midweek meal and keeps well for a few days in the fridge. Although the chickens in France have a stronger flavour because of their breeding and appellation controls, if you can source an organic chicken, you will be rewarded with a good result. Serve with a crusty baguette and butter, and a crisp green salad. Season the chicken pieces with salt and pepper. Melt half the butter in a large frypan over medium heat and cover with the lid. Add the chicken, skin side down, starting with the thick parts of the chickens first as they need the longest to cook. When they begin to brown add the smaller pieces, cooking for about 10 minutes. When all the pieces are brown on one side, turn them over and cook for a further few minutes. Divide the garlic cloves, and add them unpeeled to the pan of chicken. Cover and cook for a further 10 minutes. Then holding the lid on the pan, so the chicken pieces don’t fall, drain off the excess fat. Return the pan to the heat and add the red wine vinegar. Simmer uncovered until the vinegar is well reduced, about 10 to 15 minutes. Chop the tomatoes, you don’t need to peel them as the sauce will be strained later. Add them to the chicken with the tomato puree and the herbs. Cover and simmer again for a further 10 minutes. Remove the chicken to a serving dish and keep warm. Add the stock to the pan and simmer the sauce uncovered, allowing it to reduce again until slightly thickened. This should take about 10 minutes. Pour the sauce into a sieve and push the contents through to extract the juices. Pour into a small saucepan cooking on medium heat. Remove from heat and stir in the remaining butter to make a glossy sauce. Pour the sauce over the warm chicken pieces and serve topped with fresh parsley. First published Canberra Times 12 October 2011. If you could conjure up the classic French street market, you probably would imagine stalls overflowing with fresh olives and nuts, preserved lemons, men in striped aprons slicing chunks from giant wheels of cheese and salamis, crusty baguettes poking from large baskets and brightly coloured tablecloths spilling out of bins. 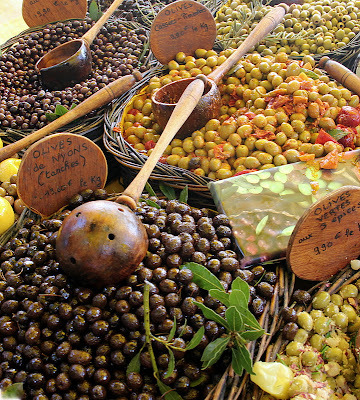 This market is the L’Isle-sur-la-Sorgue, in France. Often called the bric-a-brac capital of France or the Venice of France, it has the largest marchés aux puces (flea market) outside of Paris, and many stallholders and antique dealers set up shop all year round. Built on the islands of five branches of the Sorgue River, it’s meandering streets have a Venice-like feel with bridges that criss-cross canals and huge moss-covered water wheels. It’s on a visit to the L’Isle-sur-la-Sorgue street market we stumble across a stand, that, among all of this wonderfully fresh produce, sells ready-made take home meals. This is perfect, as hours of walking the cobblestones in the scorching sun has taken its toll. I choose between a tomato-based dish or a lemon-based one. There’s no question here - lemons and Provence are synonymous. This dish retains its flavour on reheating and with a re-creation of the recipe, I’ve been able to replicate it as close as my memory allows. 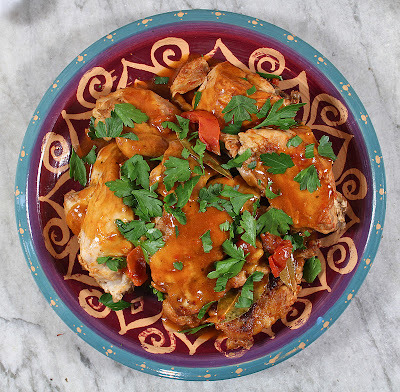 It is now a standard in the recipe repertoire for family gatherings, as its versatility means you can pretty much add whatever herbs you have on hand. This really is a simple, rustic meal, but it is jam-packed with flavour. Just don’t compromise on the preserved lemons, good quality olive oil and fresh fennel. Marinate the chicken, fennel – seeds and bulbs, lemon skin, pepper, herbs and a good slug of olive oil for a couple of hours. Preheat the oven to 200C and place the chicken thighs in a large roasting pan. 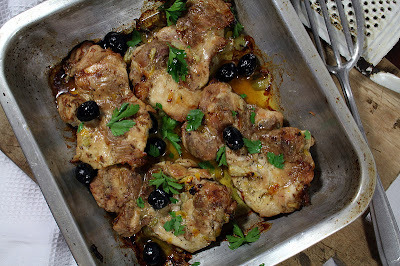 Dot the olives over the thighs and add the white wine. Season with sea salt. You may need to use two roasting pans, depending on the size. Roast for 10 to 15 minutes or until the marinade is starting to turn golden-brown at the edges. Turn the chicken thighs over and continue roasting for another 10 minutes or so, checking for burning. When cooked, remove from the oven and add a little more olive oil to moisten before serving. First published Canberra Times 5 October 2011. It’s a baking hot day in the town of Epfig, Alsace, where the thick crowds thread their way through the festively decorated streets celebrating the spring flea market. Brocante markets are huge in France at this time of year, as people save up their second hand wares through the lengthy winter to set up a stall in their local village at the beginning of spring. These numbers are boosted by a caravan of purveyors that you encounter at every market, every weekend, across the region. We are told it’s unusually hot today and this is the first market of the year in Epfig, about 30kms from Strasbourg, where the locals have gathered up from surrounding farms to join the villagers, proudly displaying their precious wares. This market, as with any other of the street markets that rotate through the Alsatian villages in spring, boasts a mouth watering selection of fresh vegetables, bread, cheeses, meats and preserves. Tacky second hand wares jostle with brocante of real interest, in displays that can include anything from clothes to kitchenalia, war memorabilia, ancient bicycles, bad art or kitsch. It can be still in its shrink wrap, antique or just pre-loved. These markets are taken very seriously, with shoppers appearing in their thousands, parking precariously on the edge of the village, intensely focused on scooping up that killer bargain. I’m no different, and stroll slowly along the cobbled Epfig streets, scanning both sides for just the right bargains to take home. From mums, dads and kids to the slick antique dealers, the displays of infinite variety extend out of sight down every street and round every corner. It’s taking all my powers of self-restraint to avoid from indulging at every second stall. An old metal chocolate mould takes my eye on a stall where two grey haired gentlemen are sitting on boxes in the shade and wearing overalls held up with braces. They are selling some items for a friend who has just closed his Patisserie after many years. It’s hard not to detect my keen interest and they bring out extra pieces from their ancient looking truck. They show me old ceramic moulds, metal cake and bread pans, an array of chocolate moulds in a variety of bird shapes and utensils of all description all caked with layers of flour. I know we’ve only got limited space in our shipping tea chests, so I’m careful to select only the extra special items. We haggle over price and they throw in extras, and more extras, until I can’t possibly carry any more and have to refuse things that you would die to get your hands on back in Australia. Brocante-ing is thirsty and hungry work so, flushed and heavily laden, we seize one of the last tables under an umbrella at the only available watering hole in Epfig, a half-timbered Winestub. The waitresses, cheeks glowing from the heat, make futile attempts to manage the influx of customers who are escaping the midday sun. The staff are overwhelmed by this invasion, but no one really seems to mind, realising that this once-a-year phenomenon is part of the package and as long as you can get a beer, all is well. The menu lists the obligatory salads, foie gras, pork knuckle and a range of desserts. 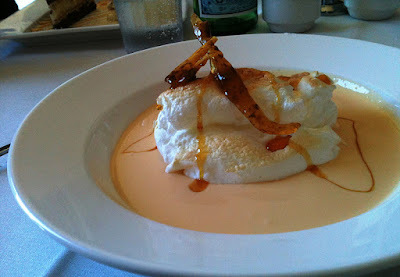 What really captures me here is the Ile Flottante, a light cloud of meringue floating in a sea of cool crème anglaise. The waitress winks knowingly at my order and indicates she’ll be right back. Although, not often seen in Australian restaurants, French women of a certain generation can whip this dessert up with their eyes closed. It’s no surprise this French classic is a hot little number, as it can be eaten warm or icy cold and still appears on many Bistro menus in France. Our chilled island of meringue was served slightly scorched with a blowtorch, a swirl of caramel and topped with shards of gingered praline. This quantity makes 6 individual servings. To make the caramel sauce, combine the sugar and ½ cup water in a pan. Cook over low heat until sugar dissolves. Raise heat to moderate, and cook, without disturbing and swirling the pan, until caramel-coloured. Swirl again, and remove from heat. Stir in ½ cup of water and the vanilla, being careful as it may spit. Cook over high heat, stirring, until the caramel is golden brown, this should take about 5 minutes, or until it registers 230F (118C) on a candy thermometer. Keep warm. To make praline, preheat the oven to 180C. Line a baking tray with baking paper. Combine ¼ cup caramel sauce with the almonds, then spread onto a baking sheet. Bake for 10-12 minutes. When cool, break into pieces. Lower oven temperature to 120C and line 2 baking sheets with baking paper. To make the meringues, beat the eggwhites with salt and cream of tartar until frothy. Add 1 cup of sugar gradually, beating at high speed until stiff and glossy. Whisk in the vanilla. Spoon large mounds, about the amount of 2 dessertspoons, on the prepared trays and bake for 20 minutes, or until a tester comes out clean. 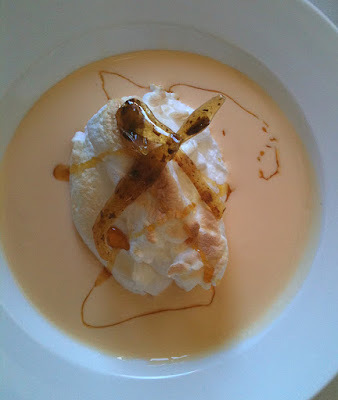 To make the creme anglaise, gently bring the cream to a boil in a pan. Remove from the heat and stir in the vanilla. Beat the egg yolks with sugar until pale. Pour in a little of the hot cream and stir to combine, then pour the egg mixture into the pan with the rest of the cream. Using a wooden spoon, stir over low heat for 3 minutes, or until mixture coats the back of the spoon. To serve, pour the cooled cream into bowls, top with a meringue, drizzle with caramel sauce and top with shards of praline.